All interviews may be found here. It started as a short story, but it was too long. So I rewrote it as a novel, but it was too short. When I tried adding subplots, it felt padded and heavy. Convinced my idea for a whodunit had promise, I kept struggling with one version after another but couldn’t get the size right. As the stack of unusable manuscripts grew, I felt like Goldilocks wandering through the three bears’ house. Too hot, too cold, too hard, too soft—would I ever find a length that was just right? Then I heard that Untreed Reads was looking for mystery novellas. Could that be the solution? I started with the novel version—the short story left crucial plot points murky—and started trimming. Getting rid of the subplots was easy, but I still had cutting to do. My goal was to end up with a novella that could be read in one or two sittings, perhaps by a commuter taking the train home. That meant moving everything along quickly, including character development. In the novel version, I’d developed characters at a relatively leisurely pace. For example, I’d devoted several scenes to murder suspect Jacqui Liston, a former beauty queen who had an affair with the victim’s husband. From her conversations with my protagonist, Lieutenant Dan Ledger, readers learned about Jacqui’s failed marriage, her string of pathetic affairs, her unsatisfying career, her heavy drinking. From Jacqui’s erratic behavior, readers could see that her early celebrity had damaged her, that it had awakened expectations her life couldn’t meet. In the novella, I could give Jacqui just one scene. I still wanted to convey the idea that hunger for fame had led her astray—that relates to the book’s themes. How could I get that across quickly? I still miss the scenes I cut. But I like the juxtaposition of virginal Maria and boozy, promiscuous Jacqui. And I think the new scene creates a strong image of a woman mired in a past that was always more illusion than reality. Other characters had to be portrayed more concisely, too. The process was challenging but also invigorating, and I think I sharpened some skills I can use when I write short stories. It took months of cutting and rewriting, but I got my whodunit down to novella size. I gave it a new title—One Shot—and sent it off to Untreed Reads. Fortunately, the editor apparently agreed that the length was, finally, just right. 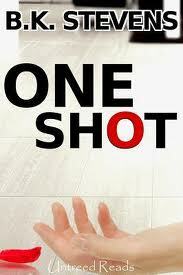 Leave a comment for a chance to win a copy of One Shot. In addition to One Shot, B.K. Stevens (Bonnie K. Stevens) has published over forty short stories, most in Alfred Hitchcock Mystery Magazine. Some stories have been reprinted in anthologies; another appeared in Family Circle after winning first place in a national suspense-writing contest judged by Mary Higgins Clark. “Interpretation of Murder,” published in Hitchcock in 2010, won a Derringer for Best Long Story from the Short Mystery Fiction Society. B.K. has also published articles in The Writer, college textbooks on composition (Holt) and on literary criticism and research (Holt/ Harcourt), and a book on Jewish education (Behrman House). Forthcoming publications include two more stories for Hitchcock, “All That Glisters” and “Murder Will Speak.” Another story, “No Good Deed,” will appear in To Hell in a Fast Car, which was edited by John L. French and will be published by Dark Quest Books late in 2012. When rising politician Karen Dodd pushes through the toughest gun-control bill in Ohio’s history, she thinks it’s her ticket to the governor’s office. But soon after she announces her candidacy, on the day she’s slated to receive an award from a gun-control organization, Karen Dodd is found dead in her comfortable Akron home, one bullet through her heart. Plenty of evidence points to her political opponents, but the mutilated family portrait and the scattered rose petals at the murder scene might suggest a more personal motive. Or could someone be trying to exploit the media sensation created by Karen Dodd’s death, using it to take one shot at fortune and celebrity? Police lieutenant Dan Ledger puts his own life in danger as he struggles to uncover the secrets of suspects who at first seem harmlessly eccentric—but who can quickly turn deadly serious. That must have been so difficult. It was like making a square peg fit in a round hole. Glad you found the match. Thanks for your comment. Yes, it was difficult, but it was fun, too. Mystery readers (and writers) love puzzles, and figuring out how to make the book work as a novella was a satisfying puzzle of its own.